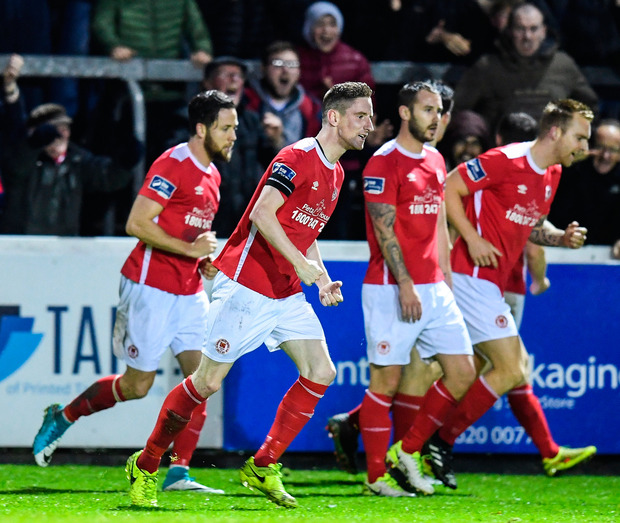 It was a game that summed up St Patrick's Athletic's season. Chaotic, error-strewn and packed with thrills and spills. But when it really mattered, they summoned up the character to deliver. Liam Buckley's charges have lived with the fear of relegation throughout this season. At full-time last night, it felt as though a weight had lifted from the shoulders of every home fan, and there was even an impromptu pitch invasion. That was premature. Word later filtered through of Galway's equaliser in the delayed kick-off in Limerick, and that means the Saints need a point in Derry next week to be preserve their Premier Division status. That's a healthier permutation than the one the Saints faced after 20 minutes when they were two down to a second-string Cork side. Worried natives were looking for a pulse. A stirring comeback brought the stadium back to life and gave the Saints the win that should ease nerves about their situation. "If we'd played like that all season, we'd be in the top four," said Buckley afterwards. "But you have to want it, you have to dig in. We've never been relegated here and I would absolutely hate that to be this year." He wore the look of a man who had endured a stressful evening. Football isn't always good for the health. In better days, Friday nights like this were the norm at Richmond Park. This venue heaved through the mid to late '90s, and titles were won under Brian Kerr, Pat Dolan and Buckley. One of the highlights of the latter's first spell in charge was a Paul Osam winner against Cork in front of a record 7,000 crowd in 1999. Even the run-of-the-mill matches were lively. The Saints have struggled to recapture that mood in recent times, even during the success of Buckley's second tenure - the league win in 2013 and FAI Cup success in 2014. Attempts have belatedly been made to address the loss of connection with the local community, and there were hopes that this game would bring back lapsed regulars, but the appalling weather conditions in the hour up to kick-off hit numbers. But in the early minutes, supporters did start to flood into the previously uninhabited and exposed areas of the ground to make their presence felt. Huddled together on the Camac, they suffered torrential rain and a torrid opening which left the Saints on the brink. Pat's had applauded the new champions onto the pitch before kick-off and continued the warm welcome with some casual defending that gave the Leesiders the initiative. John Caulfield made eight changes from Tuesday's draw with Derry, and one of the survivors, Shane Griffin, was shifted from left full to left wing and later to right back. Yet they were the more coherent outfit in the early stages. A fumble from Saints keeper Lukas Skowron resulted in the corner that gave Cork the lead, with first-choice centre-half Ryan Delaney converting. The Saints were rocked and before they could recover, Kieran Sadlier added another. 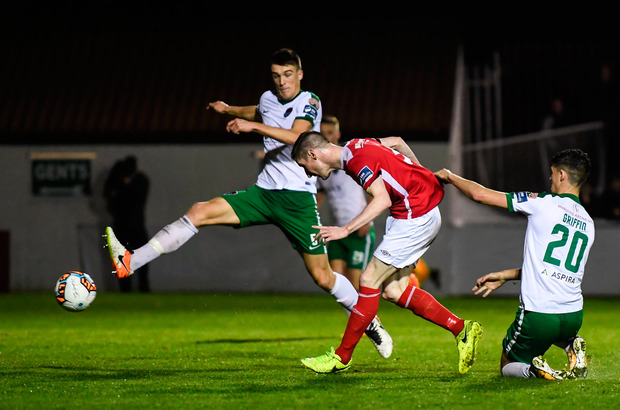 Cork's summer signing from Sligo Rovers cut in from the right, jinked away from Ian Bermingham and unleashed a stunning right-footer from 25 yards that found the net via the inside of the post. "There was nervousness," admitted Buckley. "Everyone knew the consequences of losing." The manager made an immediate change, with Paul O'Conor withdrawn and Kurtis Byrne introduced to support lone striker Christy Fagan. This was sink or swim time, and the response was impressive. Owen Garvan was influential as the Saints continued to try to pass the ball. Pressure forced a corner and Dutch centre-half Jordi Balk shrugged off attentions to firmly dispatch a header. Red shirts declined to celebrate and charged back to their own half to force a quick restart. They sensed the tide was turning, with a young City back four displaying vulnerability. The only senior player was Robbie Williams, a mid-season signing from Limerick who will be extremely lucky to have a league title on his CV. He was withdrawn at half-time, by which point the Saints had restored parity. They played through the heart of the Cork rearguard, with Bermingham and Fagan combining to tee up Billy Dennehy, who turned Delaney and finished with his right foot. Half-time checked the momentum. Caulfield introduced Karl Sheppard as part of a reshuffle, and Stephen Dooley soon followed. Skowron was still failing to inspire confidence and Cork sensed opportunity. But they had a soft centre without Alan Bennett and Conor McCormack and it was exposed in the Saints' lead goal, with Garvan relishing space in kicking off a sequence of passes that culminated with a poor touch from Griffin and a slick finish from the overlapping Bermingham - the Saints' longest-serving player. Cork's application was loose as they went in search of an equaliser and the Saints were tuned in. The enigmatic Dennehy scampered in from the left and sent a cross that Byrne steered into the top corner to leave survival within touching distance. Cork City - Smith, McCarthy, Williams (Sheppard 45), Delaney, McLoughlin; Sadlier, Bolger, Keohane, Griffin; Campion (Morrissey 76), Ellis (Dooley 61). 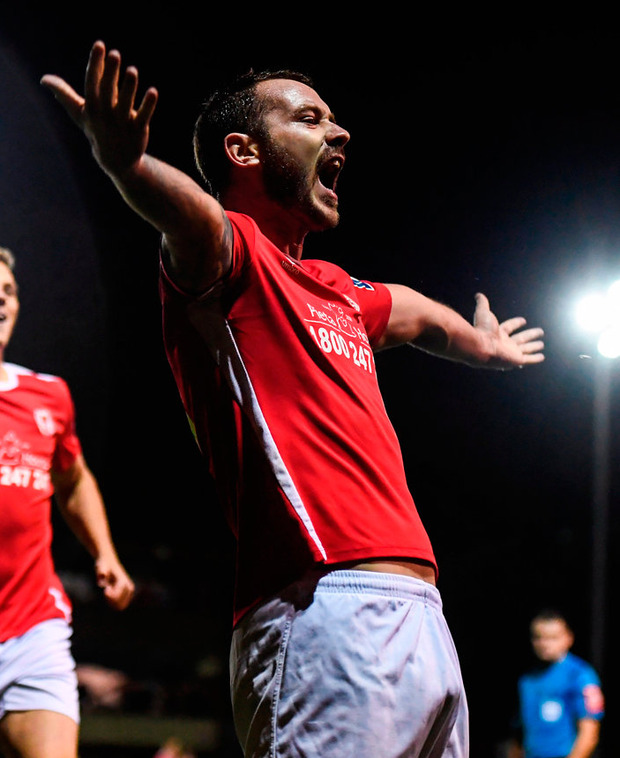 Aidan Fitzmaurice With only a third of the season gone, the sun seems to have already set on Finn Harps' hopes of staying in the Premier Division as they established a most unwanted club record. Independent.ie Sportsdesk Cork City have now gone six Premier Division games without a win after they couldn't break down Sligo Rovers at Turner's Cross. A stoppage-time penalty by prolific midfielder Shane Duggan pinched an undeserved point for Waterford against Derry City yesterday at the RSC.